"War" by Edwin Starr was one of most interesting releases by the Motown record company. Released in 1970 and a #1 song for three weeks in that fall, it addressed the growing unrest that many people felt about the continuing, and by President Nixon expanding throughout Southeast Asia, Vietnam War. Made more interesting is how just three years earlier, in 1967, Motown's Barry Gordy was still releasing records that supported the war (despite growing protests back then; most of those pro-Vietnam War songs did not sell). 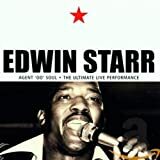 "War" was written by Norman Whitfield, who at first was hestitant to have it released as a single thinking it might be too depressing, but when he heard Edwin Starr and after much convincing and prodding, Whitfield gave it to Starr. Starr turned the tune into a very upbeat tempo dance tune, but with one of the most blunt of messages against the Vietnam War. In the 1980's, Bruce Springsteen would release a live remake of the tune.